So, spring break is over--we came back from our little trip last night and the boys are going back to school tomorrow. It was nice to get away but it wasn't the most spring-like weather--it got very cold and snowed a couple inches. We came home to about 4" of snow on our lawn. 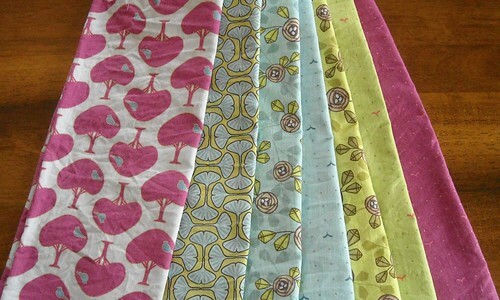 The four fat quarters on the left are from the Dolce line by Tanya Whelan. I think they're so pretty. And I had to get the stripes and dots from Heather Ross's Lightning bugs collection too. These are from the Timber line by Jessica Levitt and all of these prints (ok, not so much the pear tree) remind me of learning about them in botany classes in college. Gingko, magnolia, maple. The Norway maple tree was the first plant I ever identified using my dichotomous key, A Utah Flora. My university also has ginkgo and magnolia trees on campus. Magnolias are among the most primitive of the flowering plants. And the ginkgo is cool because it was thought to be extinct, and it is unique in the plant kingdom. I could go on, but I have wild children here who need to be put to bed. A quick note about my watercolor quilt--a couple of people asked if I could do a tutorial on it, and I can't do that because it is from a pattern written by somebody else. 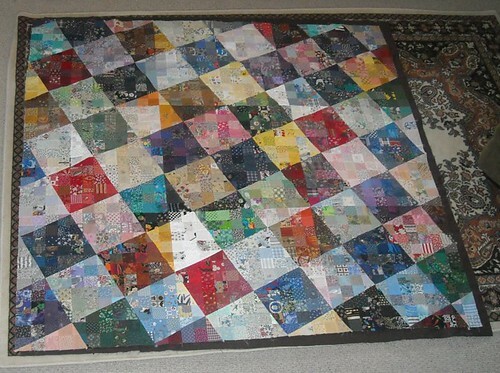 The pattern was in the May 1999 issue of Quilter's Newsletter Magazine--it is called Colourwash Checkerboard and was designed by Deirdre Amsden. That back issue is sold out on the QNM website, but you might be able to find it elsewhere. I was able to find a book by Amsden, Colourwash Quilts: A Personal Approach to Design & Technique , at Amazon. It's out of print but there are quite a few used copies for sale. If any of you get this book and make your own watercolor quilts, please let me know! 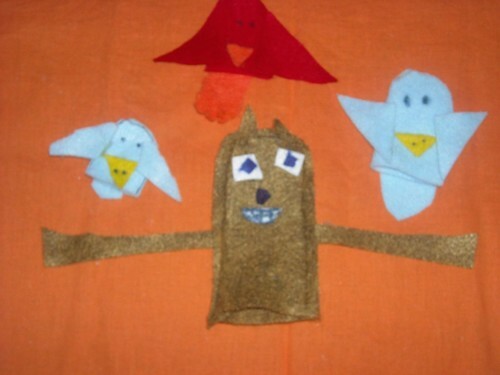 I have been working on a little flock of chickens today, maybe I'll show you tomorrow. So I've been working on some small things here. 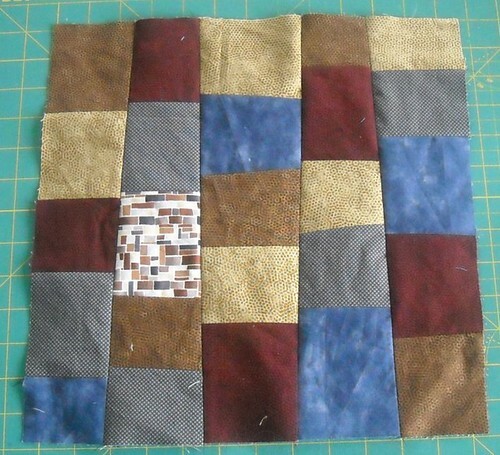 This is my March block for Block Swap 2. 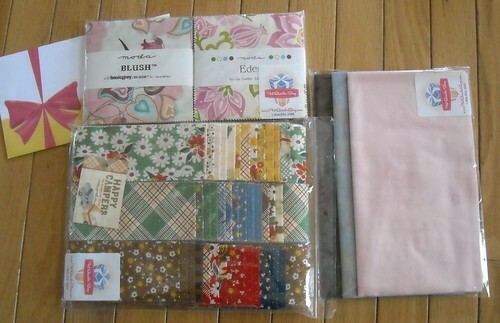 It is going to Carin of Margaret's Hope Chest and will be part of a "man quilt". 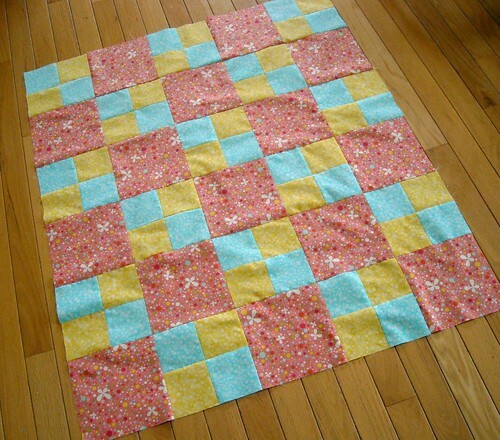 Margaret's Hope Chest is a wonderful organization that gives quilts to people in difficult situations. Please go look at their website, and if you want to know more about them, you can go listen to their (Carin and her mom's) interview with Jennifer of the CraftSanity podcast. I am almost done with my block for my other bee, but I decided to start something new for myself instead of finishing that up today. I got a Neptune honey bun with my birthday money and knew I was going to make pillows for my bed with it. 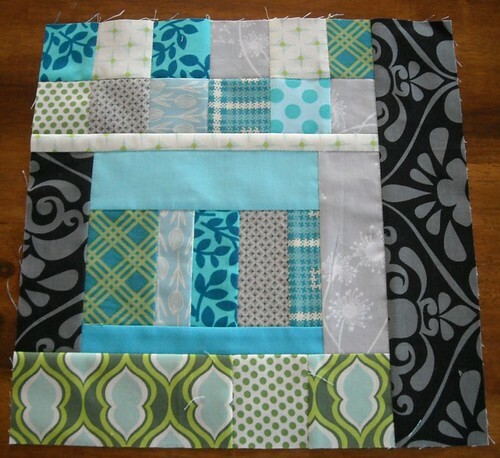 This morning, I saw this cute project on Moda Bake Shop and decided to use that block idea for one of my pillows. These little guys are made entirely out of 3.5" strips. I'm not sure how I'll put it all together, but I like what I have so far. Ira Glass on creative work. I love this video clip so, so much. Basically he talks about how it takes a lot of time and practice, doing work that isn't as good as you know you can and want to do, but eventually, if you put in the time and effort, you will get better and you will get to where you are making things/doing work that matches up with the vision you have for yourself. Please go watch it. But there are certain skill sets that I could definitely continue to work on and improve. Putting in zippers is still a bit intimidating for me. Maybe I just need to do 20 more of them or so and then I'll feel like a zipper pro, like zippers are no big deal. 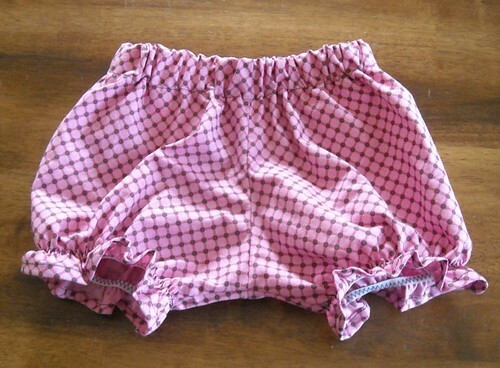 There are advanced sewing techniques like welt pockets, that I've heard of but never tried. There's the whole big learning thing that is sewing for myself and learning how to alter patterns to fit myself. I could go on and on. 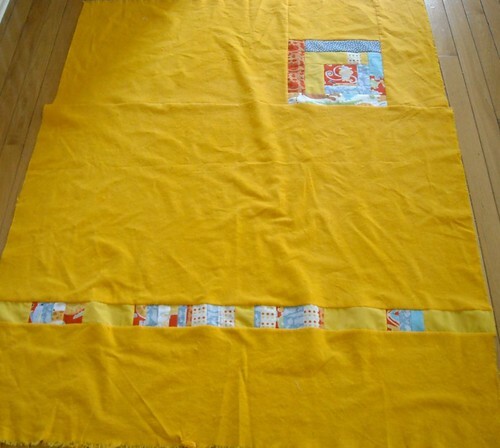 In my quilting work, which spans a shorter time period, I can definitely tell that I've grown and improved but I still have things to learn and ways to grow (who wants to do a blog tutorial about Squaring Up Quilts before binding? I don't think I learned about this properly yet!) I also feel like I am still in a learning and slightly awkward phase in my blogging, and I hope to get better at it as I work on it more over time. I'd love to hear your reactions to the video clip, if you watch it! 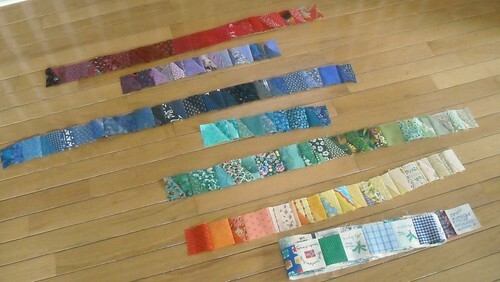 Here are the rainbow strips I have ready for putting into the back for my watercolor quilt. I measured them and I have enough to go around the quilt, about 10" in from the edge. 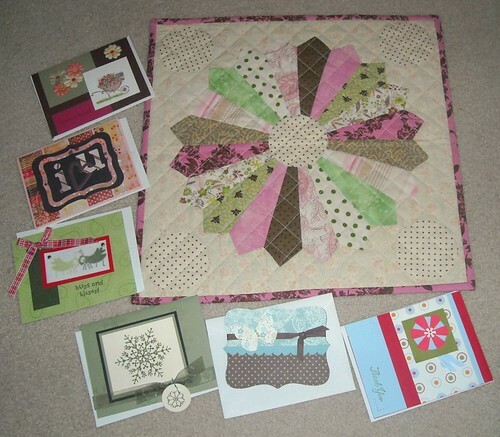 The folded strip on the bottom in the picture is my pile of signature squares. 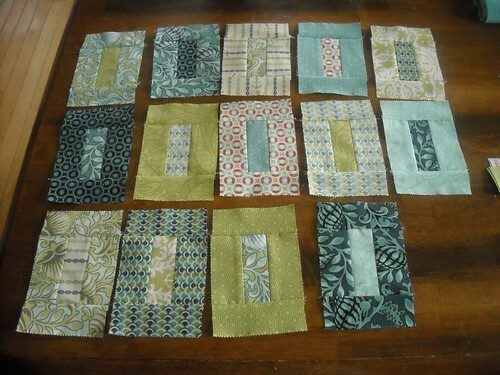 I pieced them, alternating with colored fabric squares, into several strips. And now I'm thinking about undoing that and making a solid square or rectangle with all the siggies together. I kind of want the rainbow-y strips to be the main focus on the back (I didn't have a plan, and I sewed the signatures first). What do you think? I also made the cutest, tiniest, tiered skirt for my girl today. Hope you're having a good weekend! We have a neighbor's birthday party tonight (my husband is DJing) and church tomorrow. 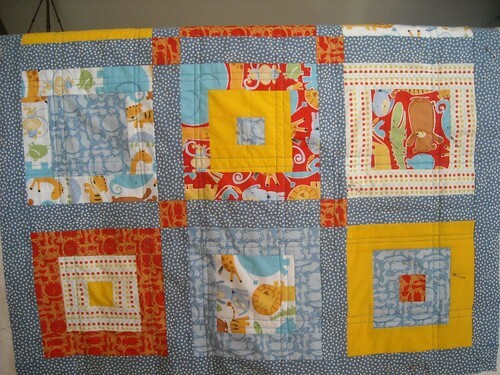 I might have mentioned, I'm going to finish up my insane quilt project. So in the last week or so I've been busy with finishing up my bee blocks and sending them out, and getting my DQS8 quilt on its way as well. 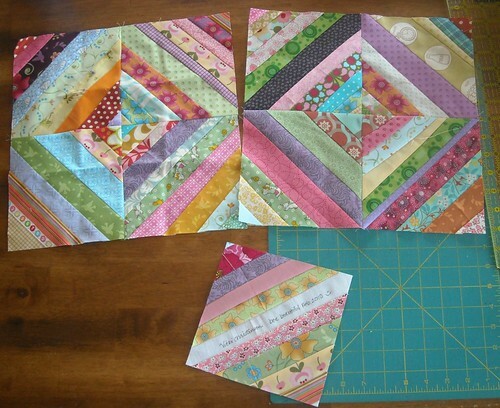 I made a second block for Rachel, and a siggie block for her too. Thanks Mom! I had to take a picture of how pretty it all is! It took me forever to decide what to get, and in the end, the Happy Campers jelly roll was on sale so I did go ahead and get it. (They unrolled it to fit it in a flat rate priority envelope.) I have no idea what I'll use it for, but something will come to me. 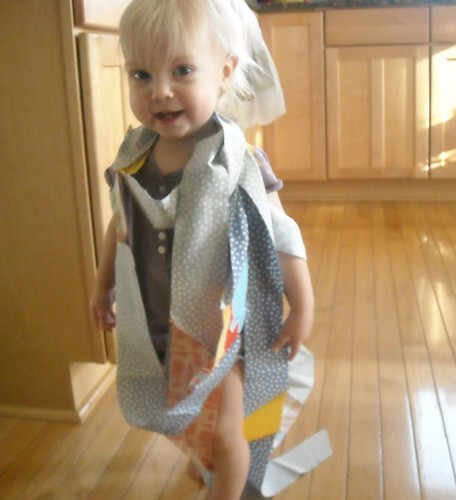 I'm planning on making another charm pack dress for my girl with the Eden fabrics, they are so pretty and just perfect for springtime. So this week I am kind of busy, mostly with fun things, and I have no sewing deadlines or obligations! 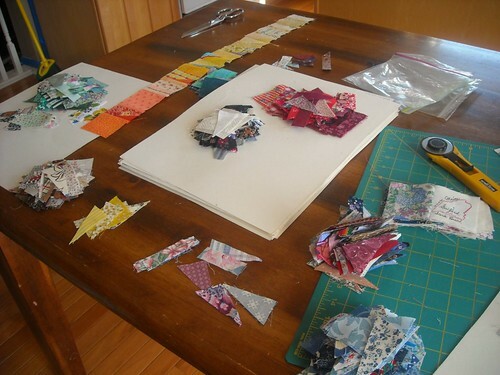 Today I pieced together some large batting scraps so I can finish up this quilt. 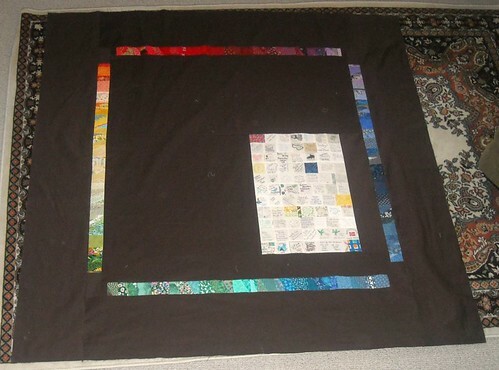 I am also planning on working on the back for the insane quilt project aka my watercolor quilt this month. Do you have any March sewing plans or goals? What are you working on?